“Joe De Yong: A Life in the West” is the story of a passionate cowboy’s life in the America West during the first part of the last century. 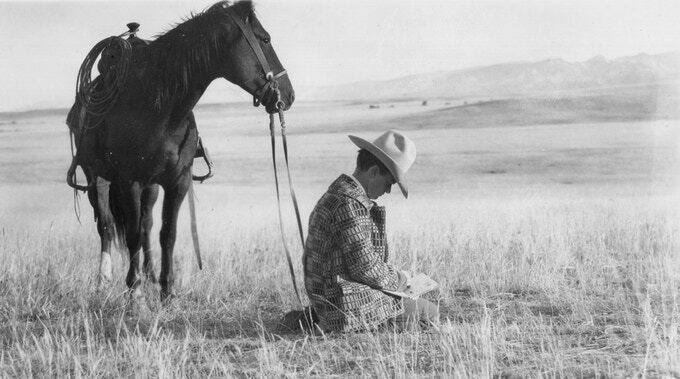 Over ten years of research has revealed the life of a relatively unknown artist/illustrator who started out to be “just a cowboy.” Turns out, Joe De Yong was quite a “mover and shaker” who touched the lives of so many in the western art world of the 1920s through the late 1960s. His was a life of challenges, including overcoming cerebral meningitis in 1913 that left him totally deaf. Never one for self-pity, De Yong went on to become the only protégé of his artistic hero – the legendary Montana artist, Charles M. Russell. He would take the skills he learned and make a life in the movie business working with Cecil B. DeMille and many others. Established in 1974, the Carriage and Western Art Museum of Santa Barbara is a non-profit organization with the mission to collect, display and preserve historic horse-drawn vehicles, saddles, and western memorabilia. Admission is FREE.